In medium bowl, mix buttermilk, hot sauce, 1/4 teaspoon of the salt, 1/4 teaspoon of the pepper, 1/4 teaspoon of the red pepper and the garlic powder. Add chicken; turn to coat. Cover and refrigerate 1 hour. Meanwhile, in 10-inch skillet, heat 2 tablespoons of the butter over medium-high heat. Add bread crumbs; cook 4 to 5 minutes, stirring frequently, until golden brown. Transfer to shallow bowl; add paprika, remaining 1/4 teaspoon salt and 1/4 teaspoon pepper. Heat oven to 375°F. Spray large rimmed baking sheet with cooking spray. Drain chicken; discard marinade. Dredge marinated chicken in browned bread crumbs, coating completely. 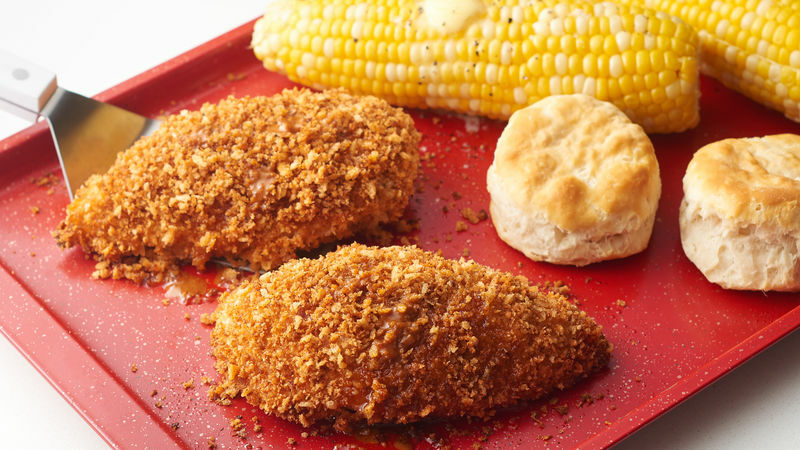 If there are any bread crumbs left in bowl, pat them on top of chicken breasts to cover any bare spots. Place on baking sheet. Wrap ears of corn individually in foil. Place on baking sheet with chicken; bake 10 minutes. Add biscuits to baking sheet; bake 22 to 26 minutes or until biscuits are golden brown and juice of chicken is clear when center of thickest part is cut (at least 165°F). Meanwhile, in small microwavable bowl, mix remaining 2 tablespoons butter and remaining 1/4 teaspoon red pepper. Microwave uncovered on High 30 seconds to 1 minute, or until melted. Drizzle butter mixture over chicken just before serving. Try serving your biscuits and even your corn with a sweet honey butter. To make it, just combine 2 tablespoons softened butter with 1 tablespoon honey. Toasting the bread crumbs before they are used to coat ensures an evenly browned chicken breast that will be extra crunchy.